You need to know most (but not all) of the material on this page. The Exam won't ask you a question directly about Kroenke et al.. Instead, you'll be asked about "a Contemporary Study in clinical psychology other than Carlsson et al." or perhaps "a Contemporary Study into a disorder other than schizophrenia". You won't get asked specifically about what's in the PHQ or Kroenke's sample or anything like that. ​This study was carried out by Kurt Kroenke to test the validity of a new psychometric test for depression, the Public Health Questionnaire, 8 item version (PHQ-8). Click here to find out how to pronounce "Kroenke"
There has always been a need for a diagnostic tool to measure the severity or type of depression. Kroenke had previously worked on PRIME-MD which was a checklist to help doctors diagnose 12 different types of mental disorder. 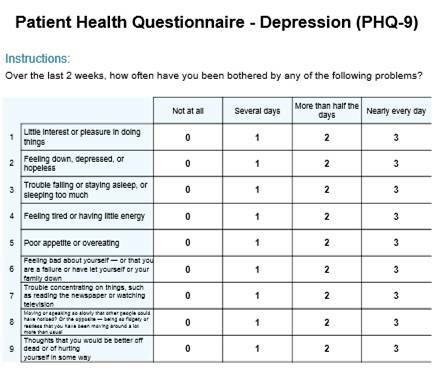 The PHQ is a questionnaire that can be filled in by patients, based on the mood checklist from PRIME-MD. Students should have come across another psychometric test for depression: the Beck Mood Inventory. It shows how scientific research proceeds, because the PHQ is being given rigorous statistical analysis to see if it scores depression accurately. It focuses on Major Depressive Disorder (MDD) as classified in DSM-IV-TR. It illustrates features of the Cognitive Approach, since it uses ﻿quantitative data﻿ to measure thoughts and beliefs. 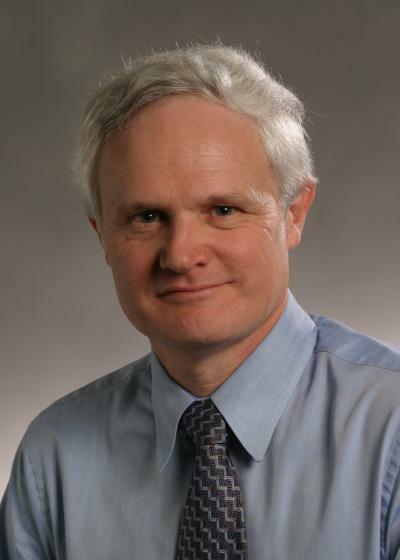 In collaboration with Robert Spitzer (who challenged the DSM-II and led the panel that created DSM-III), Kroenke had already worked on PRIME-MD, a checklist to help doctors make diagnoses of mental disorders based on DSM-IV-TR. PRIME-MD contained a mood checklist for diagnosing mood disorders like depression. Kroenke and the team adapted this into a short questionnaire that patients could fill in themselves and that could be asked over the phone. This was the PHQ-9 (so called because it asked 9 questions). Wait! Stop! PHQ-nine??? I thought this was PHQ-8! Yes, it's the same questionnaire but the ninth question is on suicidal thoughts. As we shall see, Kroenke's team, dropped that question from their survey, creating a shorter PHQ-8. The link up above is to PHQ-9, suicidal thoughts and everything. These downloads are PHQ-8, as used in this study. The PHQ does a bit more than just indicate how severe a person's depression is. It also seems to make a fairly accurate diagnosis of clinical (unipolar) depression. In particular, if the respondent scores 10 or more on PHQ, that indicates a depressive disorder (as proposed by Kroenke et al., 2001). The question is, is the score of ≥ 10 on PHQ a reliable and valid way of diagnosing someone with a depressive disorder? To find out if PHQ-8 is a valid measure of depression. In particular, to see if there is a difference between diagnosis of depression using the PHQ-8 algorithm and using the PHQ-8 score of ≥ 10. It's a formula for turning PHQ-8 results into a DSM-style diagnosis. For example, someone has Major Depressive Disorder (MDD) if they answer the first two questions on PHQ-8 with "More than half the days" but if they answer certain other questions in different ways there might be a different diagnosis. 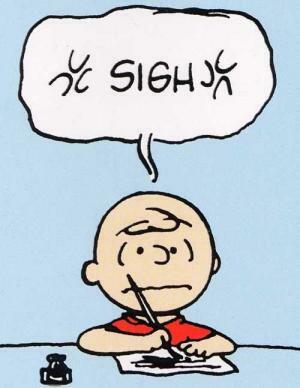 Applying the PHQ alogorithm is quite a longwinded thing to do. It's much easier to just add up the overall PHQ-8 score and see if it's 10 or higher. But if the two methods come up with the same answers, we know we can use the quick'n'easy method to make an initial diagnosis of depression over the telephone. Whether the respondent is being classified as clinically depressed using the PHQ-8 algorithm or PHQ-8 cutpoint ≥10. The number of telephone respondents who were diagnosed with depression. 198, 678 Americans who took part in a mental health survey over the telephone in 2006. This was part of a regular survey called the Behavioral Risk Factor Surveillance Survey (BRFSS) in the USA. This survey is into health in general - infectious diseases, asthma, domestic violence, etc - but in 38 states questions were asked about depression using PHQ-8. 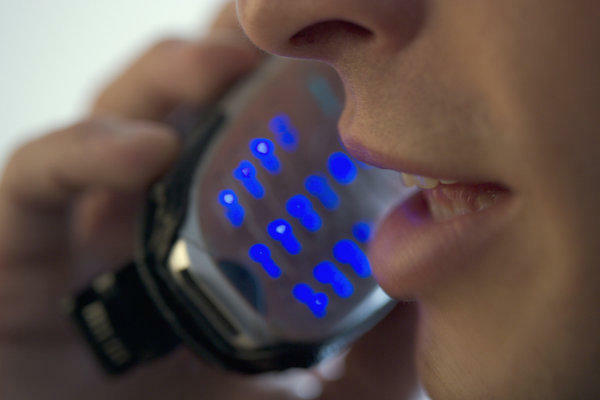 Telephone numbers are produced randomly by a computer and people who answer are invited to take part. Yes. This is one of the few examples of a truly RANDOM SAMPLE in Psychology. You don't need to memorise the PHQ-8 but you should learn an example of one question that is in it and how it is scored. Respondents were diagnosed based on their answers using two methods: the depressive disorder based on PHQ algorithm or PHQ-8 cutpoint ≥10 (a score of 10+ out of 24). Finally, the team consider sociodemographic data, like age, gender, ethnicity and employment status. Kroenke et al. used the same categories as the PHQ-9, but adapted them to the new 8-qustion scale. Based on previous research (Kroenke et al., 2001), PHQ-8 cutpoint ≥10 is a good indicator of clinical depression. 9.1% of respondents were judged to have a depressive disorder based on the PHQ algorithm; 8.6% scored ≥10 on PHQ-8. According to DSM-IV, out of the 17,040 respondents with a PHQ-8 score > 10, major depressive disorder (MDD) was present in 49.7%, other depressive disorders in 23.9% and depressed mood or anhedonia in another 22.8%. In only 3.5% was there no evidence of depressive disorder or depressive symptoms according to DSM-IV. There's a lot of data here but you don't need much of it. 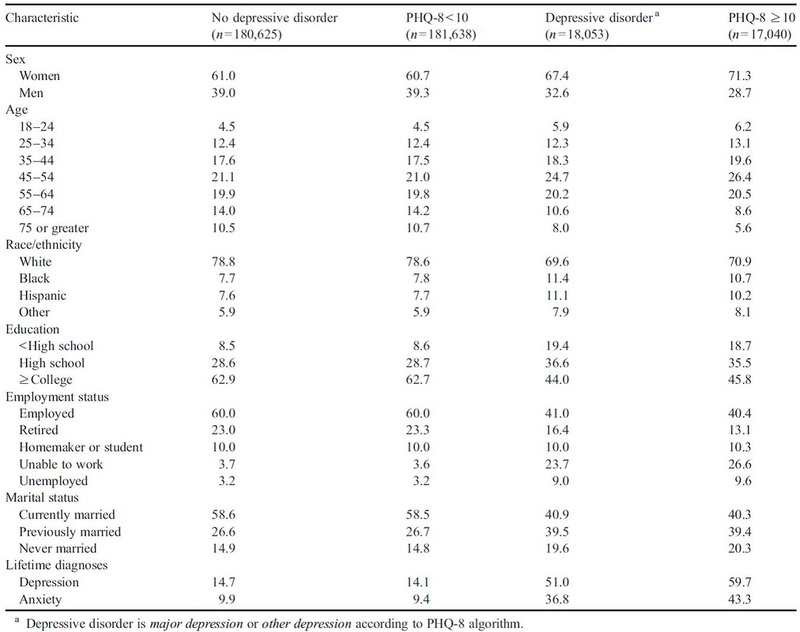 Just notice how similar all the percentages are for depressive disorder (DSM-IV-based algorithm) and PHQ-8 score > 10. Pick two particular examples to use in the Exam - like "previously married" people who are almost identical and "retired" people, where there's a bigger gap. Some of this data might be useful for you to answer questions on individual differences in mental health. Look at the difference between men and women and the "spike" in the 45-54 age group . 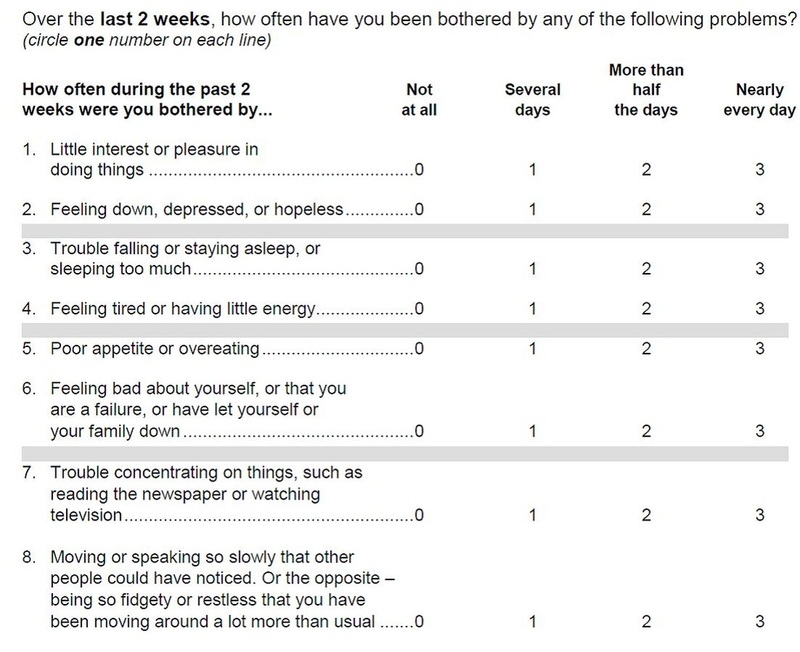 Respondents classified as depressed had more days of impairment on all 3 mental health questions. This was nearly identical whichever way depression was diagnosed (depressive disorder according to algorithm or PHQ-8 cutpoint ≥10). 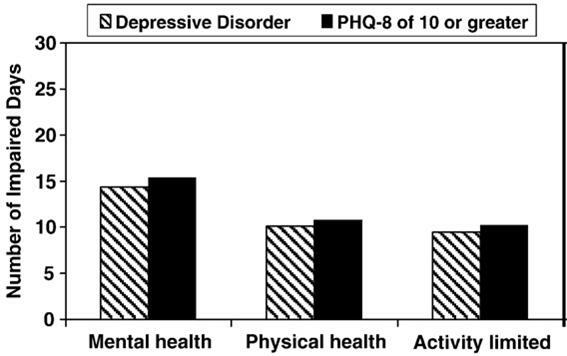 The PHQ-8 is a useful depression measure for population-based studies. Its cutpoint ≥10 can be used for diagnosing depression. Kroenke et al. have used a huge sample here - nearly 200,000 people. A huge sample size by itself doesn't guarantee generalisability, but it does mean that anomalies are unlikely to skew the results. The study was carried out in 38 of the 50 US states, including big cities and rural areas and even Hawaii. This suggests a representative sample. The study also included a range of ethnicities and age groups (age 18 through to 75+). Kroenke doesn't describe the number of people who refused to participate in the study. Presumably, many more people were telephoned but either didn't answer of declined. It's possible that these included people with the most severe mental health problems - or people with the fewest (why waste time completing a health survey if there's nothing wrong with you?). Questionnaires with closed questions tend to be reliable because every respondent gets the same questions in the same order, marked in the same way. Asking the questions over the telephone is a bit more unreliable because it introduces researcher effects. Respondents might want to conceal health problems from a stranger that they would write about if filling out the PHQ by themselves. Telephone surveys are also unreliable because the respondent might not answer on the 4-point (0-3) scale as they are supposed to, but instead start describing their experiences (qualitative data), forcing the researcher to make a (subjective) decision about how to score the response. However, the BRFSS researchers were specially trained in asking questions on mental health issues, which would have minimised (but not entirely overcome) these problems. There are two main applications for this study. One is that it shows that PHQ-8 can be used to arrive at an initial diagnosis of depression through a telephone interview (or an online diagnosis). This helps identify people who should be encouraged to visit a doctor for a more thorough diagnosis using DSM-5 or ICD-10. This should lead to people getting an earlier diagnosis and more effective treatment for depression. The Increasing Access to Psychological Therapies (IAPT) programme is a project to extend CBT and psychoanalysis to more people who need it in the UK. PHQ-8 is important for reaching people who would benefit from psychotherapy. Another is that the PHQ-8 can be used in population studies to judge the extent of depression in a community or in prospective studies to see whether people are getting better or worse when they receive treatment for depression. This helps clinical psychologists, because the PHQ-8 gives them a standardised procedure for measuring the severity of depression. The similarity in results between the DSM-based PHQ algorithm and the PHQ-8 cutpoint ≥10 suggests the PHQ is a valid tool for measuring depression. This validity is strengthened by the link between PHQ scores and days of impairment due to physical and mental health and impaired social activity. The PHQ-8 was adapted from the PHQ-9 especially for use in this study. Some changes were made. This means that the PHQ-8 wasn't exactly like the PHQ-9. The BRFSS researchers were specially trained in their job to avoid causing offence or distress with their questions. Nonetheless, they couldn't intervene in any way if they came across someone who was in great distress and a danger to themselves or others. This was why the 9th question on suicidal ideation was dropped from the survey. This was an ethical thing to do because if a respondent had admitted to being suicidal, the researcher was not in a position to intervene to help them. Kroenke et al. tested the validity of a new questionnaire for measuring depression, the Public Health Questionnaire (PHQ). The research was generalisable to the US population because it used a huge random sample drawn from 38 states, with a range of backgrounds, ages and ethnicities. The research was reliable because there was a standardised procedure involving closed questions that were asked in the same order. One question was:"How often over the last two weeks were you bothered by feeling down, depressed or hopeless?" and the options were "Not at all" (0), "Several days" (1), "More than half the days" (2) and "Every day" (3). However, there could have been researcher effects if people were embarrassed to admit to being depressed to a stranger over the telephone. They used a telephone survey of nearly 200,000 people to ask questions about mental health, including 8 questions from the PHQ. To make the study ethical, the PHQ's 9th question on suicidal ideation was removed, because researchers couldn't intervene if someone was suicidal. 96.5% of people who scored 10+ on the PHQ-8 had the symptoms of clinical depression. In conclusion, the PHQ-8 could be a psychological contribution to society. It can be used to diagnose depression over the telephone or online, as part of the IAPT programme to provide psychotherapy to more people who might need it. Notice that for a 8-mark answer you don’t have to include everything Kroenke et al did. I haven’t mentioned the results in depth, the other differences between PHQ-8 and -9 or the applications for researchers. But I have tried to make the two halves – Description and Evaluation – evenly balanced.